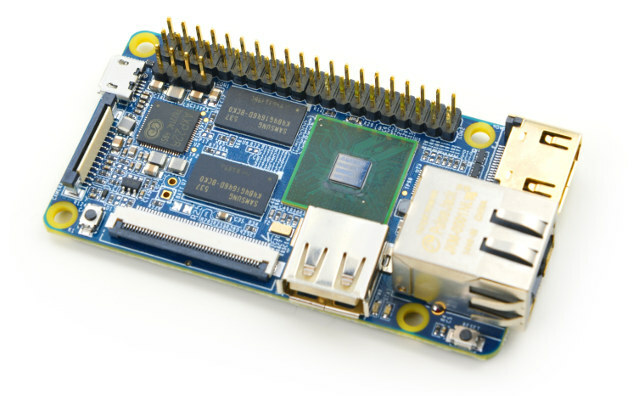 NanoPi 2 board, based on Samsung S5P4418 quad core Cortex A9 processor with WiFi and Bluetooth, has now gotten a brother, called Nano Pi 2 Fire, with wireless connectivity replaced by Gigabit Ethernet, and a power management IC (PMIC) for software power-off, sleep and wakeup. The board support Android and Debian, and you can find hardware documentation on FriendlyARM’s Wiki (in construction), and software on their Github account. The Wiki should eventually get some software documentation and links to firmware images, just like for NanoPi 2 Wiki. 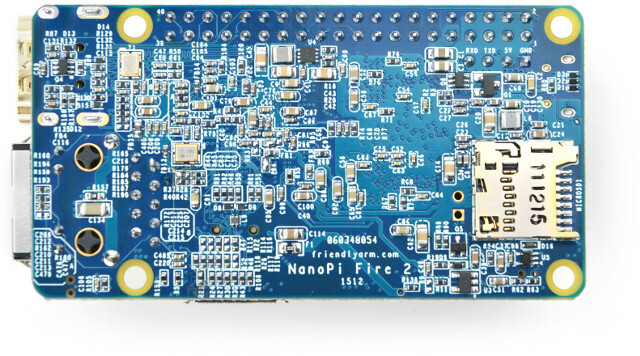 NanoPi2 Fire will sell for $29 + shipping, and should be listed together with NanoPi2 on the company’s product page. Does the S5P4418 have Linux Open Source drivers for hardware accelerated H264, MPEG2 and VC-1 (and HEVC/H265?) decoding? Is there a board with GigE + SATA-with-port-mutiplier-support ? or a board with GigE + 4xUSB3? Seems like there are so many for-kodi boards, and yet no diy-nas board other than the underpowered-overpriced plug devices. This is the closest I’ve seen: http://www.bananapi.org/p/product.html Open Media Vault does support it. IIRC A20 has little or no SATA mutiplexer support. But since he also provided performance numbers it should be ok to just combine one SATA port with a PM to get already great disk performance. I hope some Solid-Run customers come up with devices that are based on their Armada 38x SoMs. Is I2S exposed on either of the NanoPi2 boards? I looked at the schematics and it doesn’t look like it, but they are not crystal clear. What about http://up-shop.org/4-up-boards? Is the only one i know about with GbE & USB 3 (OTG though). Don’t know have they fixed CPU over head issue yet. I have a WIFI+Bluetooh NanoPi version, when running with 1.4GHz CPU clock, the board is over heat quickly and CPU will hang. Too bad there’s a over heat problem on that board, it looked quite nice, do you know if its related to that CPU design or bugged kernel ? it makes a quite pricy bundle, $100+, at that point you start to get brand nas boxes, of course if your goal is to toy with it, it’s a fair price i guess. Also if the ports USB3 offer decent performances you can set aside the mono sata2 port limitation. I think CPU over head issue is not caused by CPU design(S5P4418) or Linux kernel. Because the PCB is small especially its GND plane layer cannot consume heat from the CPU quickly like another PCB design. the board is not that small compared to rpi2/b+.. stability problems could also come from the onboard wifi chip (along with heat problems too), i’ve seen that too many times to count, try disabling it and run some tests. what’s the gigabit performance on that soc ? And with heatsink it doesn’t have the issues being mentioned here? I have Bluetooth turned off and the WiFi chip is at room temperature. I suspect that when people use this chip in commercial product that they mount the CPU against a metal chassis or provide some other form of heatsinking. Do Samsung have any relevant app notes?